Often, you have sets of data you want to present to your application users in a table, organised by score, or weight. It could be something as simple as top 10 posts on your website, or a fun leaderboard for a game you created. It's a poor experience for users if they have to reload the page every single time to see changes in the leaderboard or their ranking. A much better experience is for them to see changes in realtime. Thanks to event broadcasting and Pusher, you can implement that in a few minutes! Pusher is a hosted service that makes it super-easy to add real-time data and functionality to web and mobile applications. In this tutorial, I'll be doing a walk-through on creating a simple realtime table for a Laravel/Vue.js app using Pusher. First, we will build a simple game. Then, we will register and call events for interactions with the game, and finally, we will display our realtime table with Vue.js. If you do not already have a Pusher account, head over to Pusher and create a free account. Then register a new app on the dashboard. The only compulsory options are the app name and cluster. A cluster simply represents the physical location of the Pusher server that would be handling your app's requests. You can read more about them here. Tip: You can copy out your App ID, Key and Secret from the "App Keys" section, as we will be needing them later on. To let Laravel know that we will be using Pusher to manage our broadcasts, we need to do some more minor config. 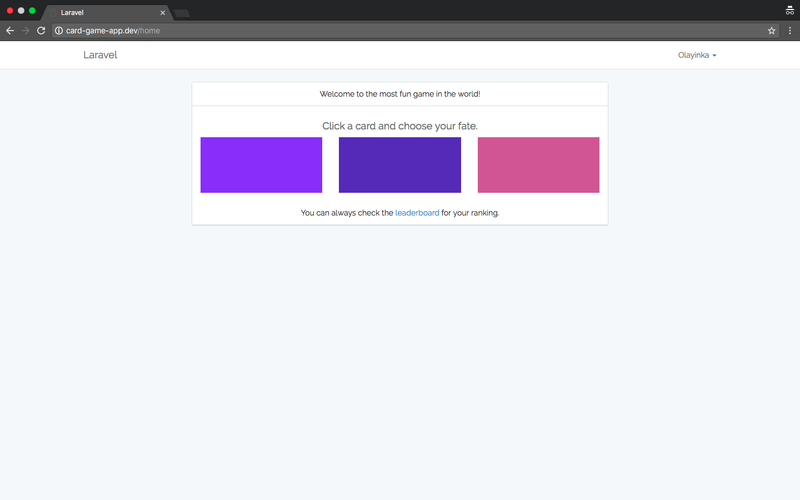 We will be creating a simple game that will increase a user's score by a random number based on which coloured card the user clicks on. Not a very fun game, but it will serve its purpose for this tutorial. This will create our basic auth routes, pages and logic. Tip: The -m and -c flags create corresponding migration and controller files for the model. * Run the cards table migrations. Next, we will define a model factory for our cards table, and edit its seeder file. * Defines the model factory for our cards table. This will create 10 random cards, with random values and colors thanks to Faker. Tip: Model Factories are great for database testing. Remember, we want to keep our code DRY. Tip: Make sure you edit your database details in the .env before running the migrations and seeder. The auth scaffolding provided by Laravel also creates a dashboard page on the /home route handled by the index method in the HomeController class. Let's edit the index method to take 3 random cards from the database and display to users who are signed in and want to play! 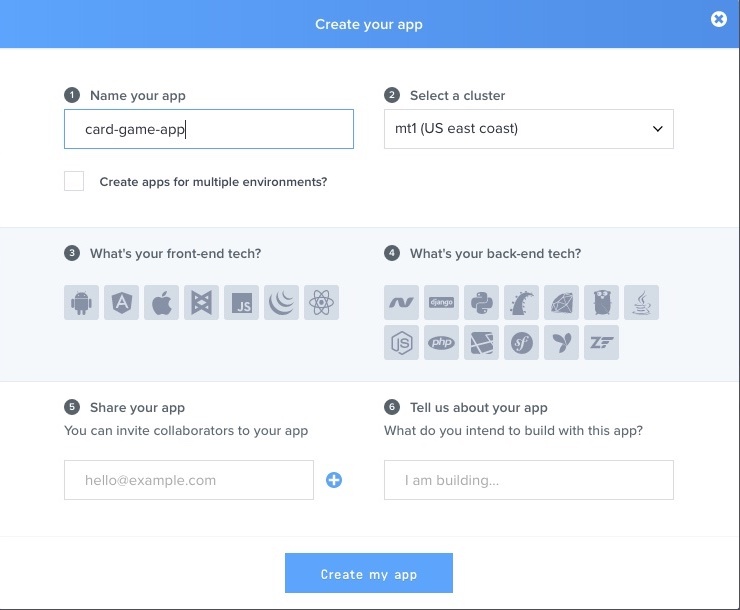 Next, we will create a route and controller action for when users click on a card. Tip: Our web routes are located at routes/web.php in Laravel 5.4 and app/routes.php in older versions. The show method above gets a user, adds the value of the selected card to their score, then redirects the user back with a flash message containing the value of the card. You can start your local server and navigate to the /home route in your browser to register/login and see our brand new game. Tip: Valet makes development of Laravel applications on your local machine much easier. You should check it out. You can also create seeders for users, so you have some test data to work with for the table. Tip: Events are created in the app/events folder. To inform Laravel that an event should be broadcast, we need to implement the Illuminate\Contracts\Broadcasting\ShouldBroadcast interface on the event class. The broadcastOn method returns the channel that we want to broadcast on, and the broadcastWith method returns an array of the data we want to broadcast as the event payload. We have specified leaderboard as the name of the channel our app should broadcast on, so on the front-end we also need to listen on that channel to detect broadcasts. The Channel class is used for broadcasting on public channels, while PrivateChannel and PresenceChannel are for private channels (those would require authentication for access). By default, Laravel serialises and broadcasts all of an event's public properties as its payload... broadcastWith helps us override that behaviour and have more control over what is sent. At this point, playing the game and having scores updated would trigger this event, and broadcast the payload we specified to Pusher. We can log in to the Pusher dashboard, and check the debug console to see this. We also want new users to be automatically added to our leaderboard, so we will trigger the ScoreUpdated event when a user registers by defining a register method in app/Http/Controllers/Auth/RegisterController.php to override the default register method created by the Auth scaffolding. * Handle a registration request. Finally, we can create our leaderboard and start listening for broadcasts. Tip: Laravel 5.4 already ships with Vue.js as a front-end dependency, hence after npm install, we can get to writing Vue.js code right away, and Laravel Mix (via Webpack) will handle the rest. In the listenForChanges function above, we instruct Echo to listen for ScoreUpdated broadcasts on the leaderboard channel. Remember, we specified this channel when we were configuring our broadcast event. Now, whenever Pusher receives a broadcast and simultaneously sends it to our app, Echo will be listening, and will use the callback function we specified as the second argument for the listen function. Our callback basically checks for a user on our leaderboard, then updates their score, or adds them to the table, depending on whether they already exist or not. We also make use of the computed property sortedUsers for sorting our users according to their score in descending order. And we're all set! You can navigate to the app homepage to see the leaderboard. Tip: You can always run php artisan serve to use PHP's built in server for testing purposes. And a whole lot more. If you've thought of any other great ways to use Pusher and Laravel, let us know in the comments. The entire code for this tutorial is hosted on Github. You can look through and ask questions if you need more information.